You are currently browsing the category archive for the ‘Cornelius Fudge’ category. More on WDEL’s switch up. Sorry to elaborate but you see, they are the reason I decided to settle in Delaware. I have never been opposed to anyone expressing their views.. I have always been opposed to being forced to listen to ONLY one view. And the former is what WDEL used to offer… Daily I got two viewpoints, morning and afternoon… Sometimes they merged. Sometimes they didn’t. Ironically they merged on local issues for the most part; on national issues, … umm. not so much. And the latter is what they offer now. Now those of us who live in the real world (conservatives by their creed, don’t) know that the only thing consistent is change… So though it is with heavy heart that probably the only person in this nation who could get ahead of me and tell me stuff I didn’t already know, is no longer at WDEL, the pragmatic acceptance says that a new reality is upon us. We can use it; or be ignored by it. I listened to Susan Monday for a while this morning. Even though she tried to get calls from upstate, they didn’t come… Her topic was Trump… and whether we thought he was “presidential enough”, basically she was playing right out of the Rubio playbook which would immediately disinterest the entire New Castle County. Calls came in from Lewes, Milford, Milton, Frankford, Salisbury all sticking to the topic. There was no Liz. It was made stark reality by the station’s insistence of calling the station, ALL-STATE radio to advertise it was statewide, and not local. Today’s show may have been carried statewide, but it certainly wasn’t listened to… state wide…. Then I remembered something. During the golden years of blogging which I would rank between 2006 to 2010, one of the greatest things about it was that we had an all-state community. We all commented on each others blogs, north and south. And we were loose cannons,… pretty much calling each other stupid for not agreeing with us, and it was lots of fun. But what emerged from all that was an understanding of why they thought the way they did… If it wasn’t logical, we saw it was emotional. It it wasn’t practical, we saw it was deeply embedded in how they were raised… Did I say it was fun? But, over time in the back and forth and back and forth, if an idea was lacking in currency it quietly disappeared. For example, global warming which caused some of the most heated conversations, over time won convert after convert over to the side that humans need to do something. It wasn’t a miracle of persuasion. It was the preponderance of the evidence. The current went the other way with guns. Those originally wanting to ban ALL guns are nowhere to be found today. Again due to the preponderance of evidence. It is with sadness that the civility found in the printed words flying back and forth, cannot be found in spoken words replacing them. There is probably a reason for that; one primarily being that the world of written word allows us to take words back from between uttering them and them being communicated. Not so with speech. But the thought did occur to me today that these people below the canal live in their own little world where their own little world view makes sense. The only way they will grow and expand their knowledge is for them to hear from different perspectives; perspectives which make them realize that they are living on a island and the appearance of water rising higher every year around them is no illusion. There are things out there they need to know. So it does make sense then for Al Mascitti’s supporters to call the station and explain things as they are, to engage Susan in conversation. It does not make sense for them to boycott the show in deference to Al. Especially when it comes to communicating that the entire problem we have with America today is not because we have a black president who most of America elected because they thought he was pretty awesome….. it is because most of those in Congress refused to do their Constitutionally mandated job because doing so, would make that black president look even more awesome. We have broken national government; it is entirely the Republican’s fault. Constantly bringing up this fact repeatedly would make those who have only heard one line across the last eight years, that line that Obama has been an ineffective president, actually have to confront the fact that THEY were the ones who throttled government down to a standstill by voting Republican, and therefore THEY are the ones responsible for all our recent tribulations.. one being Donald Trump. Reminders that facts make a difference. So to keep Al’s legacy alive, perhaps it is fitting to call Susan Monday to say you represent the top half of the state, and then ask her your question…. politely. Hello! We, up north, were wondering why you purposefully are avoiding the REAL issues? Issues like allowing the wealthy to make up new rules that steal all the middle classes’ money. Issues like crippling unions so none of us get paid anything close to what we are worth. Issues like underfunding government so much it hurts all of us. Issues like allowing hidden money into elections, forcing politicians to be bought so they then pay their purchasers back with our tax money. Issues like saddling our children with huge levels of college debt we didn’t have when we bought our first house. Issues like not doing anything to stop carbon pollution. It would be in WDEL’s interest to allow as many as possible of those liberal calls from the North to go through… So it would indeed be ALL STATE radio. For across the last two days, I have yet to see any reason why anyone north of the canal would listen at that frequency between 9 and 12 weekday mornings. Afternoon Reminder: Go Vote In School Elections! But because of the corporate attempt to stock our school boards, this is one necessary vote. Unless you LOVE corporations running your kids into a hole in the ground… you need to vote Minnehan in Christina School district. There Is A Good Reason Our Children Are Failing In Schools. On this link, there is a test question that hit the schools in New York State and the questions regarding that story. Simply put, if you don’t take the time to do this test, ( 5 minutes) you should not have any say in education. Once you see this, you cannot have any qualms as to why our children are failing…. It is not the teachers. It is not the principals. It is not the school boards. Btw, what score did you get? Well let’s examine what happens when a state or a school district fails? Angry parents call their legislators. Legislators demand more tests. More tests cost more money. Legislators demand and get more money to make more tests to help analyze and to study the problem. Our question is: who gets rich? If every student passed the first time with flying colors, … hmmm. I wonder how many tests there would be then? Hmmmm. Something is amiss at Hogwartz. Under a ruling by Cornelius Fudge of the Ministry of Magic, all witches and wizards must be tested this school year for what is properly called the end of year exams. Those scores will determine if Prof. Snape, Ms. McGonagall, Ms. Trelawney, Prof. Flitwick, Ms. Potts, Hagrid and Professor Dumbledore will return to teach the following year. It is called accountability. if one’s students don’t pass then one must have been a terrible teacher and will not continue serving at Hogwartz in the following school year…. The tests are done on magic parchment. When one writes with a magic quill, the writing appears on another copy parchment deep within educational department of the Ministry of Magic. So when any student jots down an answer and seals it with a period at the end, that answer is recorded under that student’s name deep within the ministry. There appears to be a massive shortage of magic parchment. It is in very short supply. So the Ministry of Magic has moved up the test and is spreading its taking over 3 months so each day a few people can take it. That way, they say, everyone by the end of the year will have taken the test and staffing needs for the following year can be solicited. 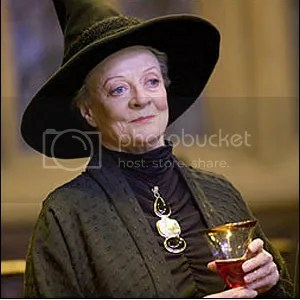 Ms McGonagall is scheduled to have her students take the test in March…… The test is a standardized test that is meant to test a student’s entire yearly knowledge. That includes material covered in March, and April, and May. But if the test is in March, and the subject matter it covers will be taught two months after the test, won’t that cause Ms. McGonagall to be considered an ineffective teacher?